In 2009, we hired Craftsmen's Guild to remodel our home. It did not go well. One lead cleanup and two lawsuits later, I hope I'll never see the Amini brothers again. This story series chronicles the lingering repercussions of our bad contractor experience. 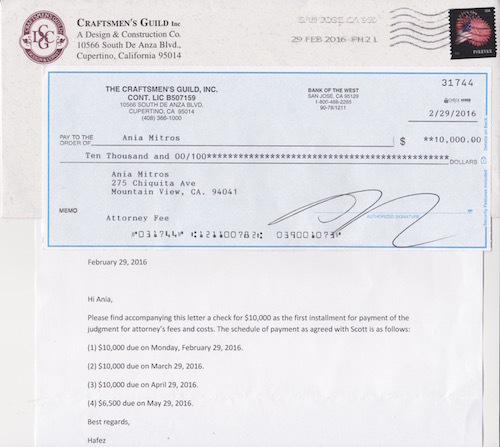 Craftsmen's Guild's first restitution check after losing their lawsuit against us. I cannot hear a middle eastern accent without shuddering. Recently I walked into a store and a nice man offered assistance in an accent just like Mike Amini's. I suddenly felt slightly queasy. My gut response was distrust, an expectation of lies and deception. It's like this every time I hear a Persian accent now: I have to take a breath and remind myself that not every Iranian is an Amini. This is learned implicit bias. This is something I fight against. I remember the first day I met Mike Amini. He came to our house, looked around, and sat at our dining room table to sell his firm. He told us what Craftsmen's Guild could do for us. He answered questions. He set expectations. I remember the second day I saw Mike Amini at our house. I had called him and asked him to come because the remodel was not going how I expected, not at all. I had called him hoping that he'd talk some sense into his brother, Matt Amini, who was managing the project. I remember how surprised and disappointed I was when I realized he wasn't going to steer the project back onto the course I thought he'd promised. I remember the day Mike sat on our back porch and said things from which I understood his firm had experience suing clients. I remember the day Mike showed up unannounced on my front door step and I was afraid to let him in. I remember the day a threatening letter showed up from Mike Amini's lawyer. I remember the day a stranger on my doorstep served me the lawsuit that Craftsmen's Guild ultimately lost, with this check being part of the court-mandated repayment of some of our legal fees. I hope for no more Amini days to remember. When I see the Craftsmen's Guild booth at the Mountain View Arts and Wine festival every year, my stomach sinks as I imagine my neighbors having Amini days to remember. One of my favorite city events is now an event to avoid.